The last two months have been extremely busy so please excuse the lack of updates on the site. The end of March and start of April were spent continuing to learn how to sail the boat. Over the Easter long weekend I took Rafiki out for my first serious solo spin - a 250 mile round-trip down to Start Point (just near Plymouth). Then on April 20th Mikey and myself delivered the boat from Gosport down to Pornichet arriving just in time to catch a train and plane and get back to the UK on the Sunday night. The following weekend was the Pornichet Select 650-my first race. The plan was just to get around the 300 miles course in one piece to make sure I got the race qualifying miles under my belt. The sailing was conservative but we recovered from a horrible start to record 19th out of 85 which was good effort for only my 10th time out. Straight after the race it was into preparation for my 1000 miles qualifying sail. I left the following day and thereafter followed a torturous 12 days of horribly light winds. I had planned for a maximum of 10 days and was due back at work. I also had my mum due into London for a week so the agonisingly slow pace was immensely frustrating. There are plenty of new photos in the Gallery. Next up is the MA Peron (May 25-27) followed by the Mini Fastnet (June 3-10). Sails aren't the only thing that will be going up and down during this campaign. Knowing sailing, I can bet that morale is destined to be similarly up and down. Much of this campaign depends on gaining entry to as many races as possible to cram as many miles of racing under my belt as is possible. Entry to the races is hotly contested with all of the prominent races sgnificantly oversubscribed. So it was a great boost to find myself scraping on to entry list for the Mini Fastnet as 84th entrant out of a possible 84. Contrast that with my disappointment when I came back a week later to discover that the official list had been changed and I was now in 87th, 3rd place on the waiting list. Given that the race is now twice (167 entries) oversubscribed I should probably be grateful that I am 3rd rather that 20th or 30th on the waiting least. I can reasonably hope for a few dropouts and that I will again scrape back into the main entry list. Updated March 21st: The Mini Fastnet list has now been expanded to 100. So, I'm in! I've just spent a weekend on my hands and knees...and my knees are constantly reminding me about it. It hasn't taken long to realise that there isn't much room down below in these boat - especially if you have a canting keel and keel box to fit in there. I'm hoping that once I get sailing rather than preping I'll be spending a bit more time on deck - something like 18+ hours a day if reports are anything to go by. 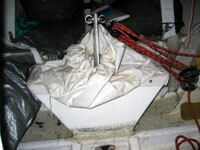 The main task was to glass in the keel box - which surrounds the keel and stops the water pouring into the boat. It's not a structural or load bearing bit of the boat but you certainly wouldn't want to lose it if it sustained some sort of impact. It's more than a little cliched but this was the moment we'd been waiting for. Of course as usual there were a bunch jobs to be sorted before we could cast off. Adrian from Insight Marine was down to help out with the electrics and instruments. Alex and I also needed to attach the bracket for outboard - a job which carried out with the maximum of effort. A Mini campaign is certainly not all about sailing. Much of it it about onshore organisation and administration. And for that side of things there is no bigger day that February 15th. This is the day that entries open for the 2006 calendar of races. That means running around finding entry forms on websites, e-mailing race orgnisers and trying to track down IBAN and BIC codes for sending entry fees. For those of us in the UK things are a little more complicated, relying on international bank transfers instead of cheques, exchanging pounds into euros, and depending on the British postal system as well as the French one as many of the forms need to be physically mailed in.